Today is Day 2 in my week devoted to "The Grinch" so I'm sharing how to make your very own Whoville Christmas Trees! I love how nothing in Whoville is perfect or straight - don't you love the curves everything seems to take? These little trees are the perfect accessories to go alongside yesterday's post, Cindy Lou Who's House. If you haven't purchased your tutorial yet, head on over to my Online Store to get yours today! 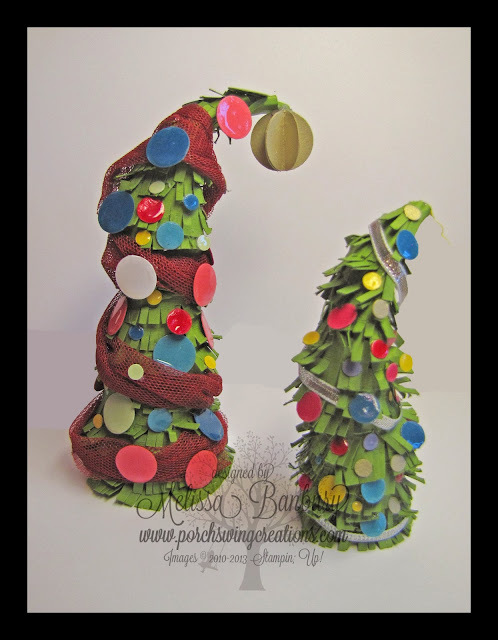 There's still plenty of time before Christmas to get yours made and out on display with these trees as an added touch - its sure to be a conversations starter! 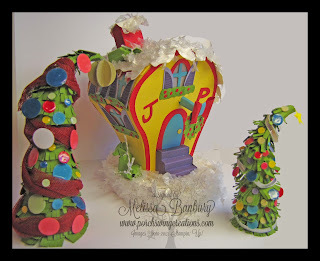 Follow along with the supplies listed below to get creating your Whoville tree forest! 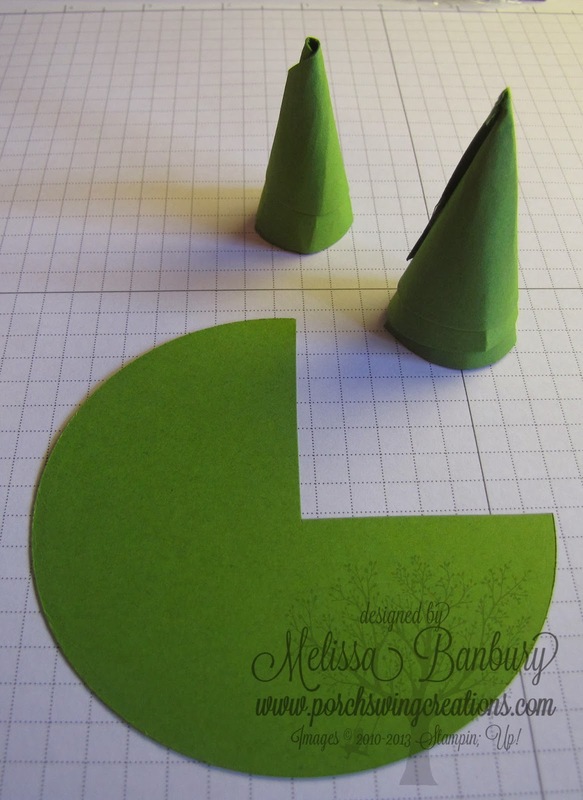 Cut out 3 circles using the 3rd to largest circle in the Circle Framelits from Gumball Green cardstock. This tutorial is for the smaller of the two trees...to make the larger tree cut 3 circles approximately 6" in diameter. Cut away 1/4 of each circle. Shape into a cone; each cone slightly smaller than the last. Glue the edges together with hot glue. Cut strips of Gumball Green paper 1/2" wide x 8 1/2". Using paper snips cut small slits along the entire length to create fringe. You'll need approximately 3 strips to cover the smaller tree and 6-7 for the larger. Glue the cones together with the larger cone on the bottom. Assemble them so the tree has a curved shape. Bend the top cone at a sharp angle downwards. 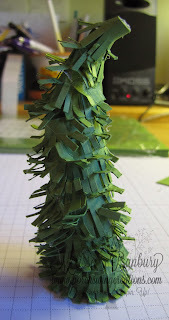 Begin gluing the fringed cardstock around the tree, beginning at the base. Continue in this manner up the entire length of the tree. "Fluff" up the fringe to give the tree more shape and character. Wrap a length of Silver ribbon around the tree and glue in place with hot glue. Stamp the star from the set Snow Day in Daffodil Delight on Whisper White cardstock. 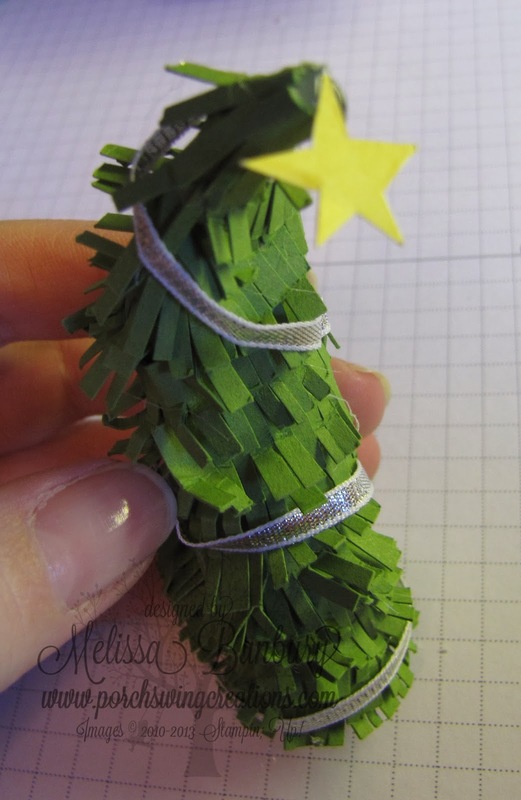 Cut out with paper snips and glue to the top of the tree. Punch a variety of sizes of circles using the Owl and Cupcake punches from bright colored cardstock. 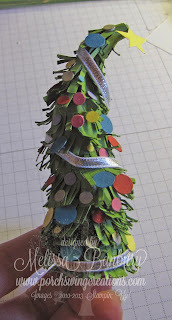 Glue to the tree with Tombow adhesive. Apply Crystal Effects to each bauble on the tree for added shine. Put on display and ENJOY! These are just as awesome as your house. Gosh, you are so talented!! !